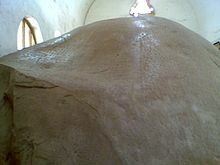 The Junagadh rock inscription of Rudradaman contains an early Prashasti, by Western Satrap ruler Rudradaman I, circa 150 CE. Prashasti (IAST: Praśasti, Sanskrit for "praise") inscriptions are euologistic inscriptions issued by Indian rulers from 1st millennium CE onwards. Written in form of poetry or ornate prose, the prashastis were generally composed by the court poets. The prashastis generally contained genealogies of the rulers (or other issuers subordinate to them), their achievements (especially military activities), their comparisons with legendary heroes and other details. The inscriptions issued by the subordinates often recognized the rulers as the descendant of a deity, and bestowed titles and honours upon them. One of the first known prashastic inscription in Sanskrit is the Junagadh rock inscription of Rudradaman (circa 150 CE), the first long inscription in fairly standard Sanskrit that has survived into the modern era, which became a prototype for Gupta era poetic prashastis. According to Salomon, the inscription "represents a turning point in the history of epigraphic Sanskrit. This is the first long inscription recorded entirely in more or less standard Sanskrit, as well as the first extensive record in the poetic style. Although further specimens of such poetic prasastis in Sanskrit are not found until the Gupta era, from a stylistic point of view Rudradaman's inscription is clearly their prototype". The Tamil meykeerthi inscriptions are similar to the prashastis, but feature far more standardized formats. Prayaga prashasti (4th century CE), Gupta dynasty: Lists the rulers against whom the Gupta king Samudragupta fought. It also describes the policy that he followed toward each set of rulers. ^ a b Kumkum Roy (2008). Historical Dictionary of Ancient India. Scarecrow Press. p. 252. ISBN 978-1-4616-5917-4. ^ a b Bernard Bate (2013). Tamil Oratory and the Dravidian Aesthetic: Democratic Practice in South India. Columbia University Press. p. 151. ISBN 978-0-231-51940-3. ^ Salomon 1998, p. 89. ^ Ichimura, Shōhei (2001). Buddhist Critical Spirituality: Prajñā and Śūnyatā. Motilal Banarsidass Publisher. p. 45. ISBN 9788120817982. This page was last edited on 11 April 2019, at 02:27 (UTC).